Are you ready to take your pet on vacation? Did you ever consider that your pet might need a vacation? The next time you make plans to hit the road, don’t leave your pet behind. Whether you travel fifty or a hundred miles together, both you and your pet will enjoy the company, the scenery, and the change of pace. When you’re traveling with your pet, it’s about the journey and the destination. Your adventure begins the moment you pack up your car and drive away. Preparation is the key to making it safe and fun from beginning to end. As you make your plans, consider only destinations where your pet will be just as welcomed as you. Family camping trips and beachside weekends are great pet-inclusive vacation alternatives. Your family will enjoy their time in the sun and your pet will have lots of room to run and play. Whether your destination is a national forest campground or a condo near the ocean, be sure to confirm any pet policies, restrictions, and leash laws before you make your reservation. If you prefer to avoid the great outdoors, check the Trip Advisor travel site for pet-friendly hotels. You’ll find listings throughout Connecticut and beyond. If you prefer private accommodations, you’ll also find single family vacation rentals. Many Trip Advisor listings include user reviews to guide your search. Check Airbnb for private listings in your destination city. The Airbnb article, “How can I tell if a listing is pet-friendly?” offers tips on conducting your search. If your pet isn’t feeling well, it can ruin their fun. Before you leave, schedule a visit with your vet. Make sure your pet is healthy, up to date on all preventative care, and fit enough to enjoy long active days. Ask your vet about remedies for car sickness and other possible pet vacation problems. While you’re on vacation, your pet will have the same needs as they have at home. That means you’ll have to pack everything or find a place to buy it along the way. Be prepared to spend every minute with your pet. Plan events and outings to include your pet and remember these pet vacation tips. Never leave your pet alone in a car, hotel room, or anywhere else. Don’t visit attractions that might agitate or frighten your pet. Avoid bite risks: keep your dog on a leash, avoid large crowds, and don’t encourage strangers to play with your dog or pet him. Make sure your pet wears a tag with your name, phone number and email address in case you’re separated in a crowd. Plan enough travel time to include regular pet stops along the way. 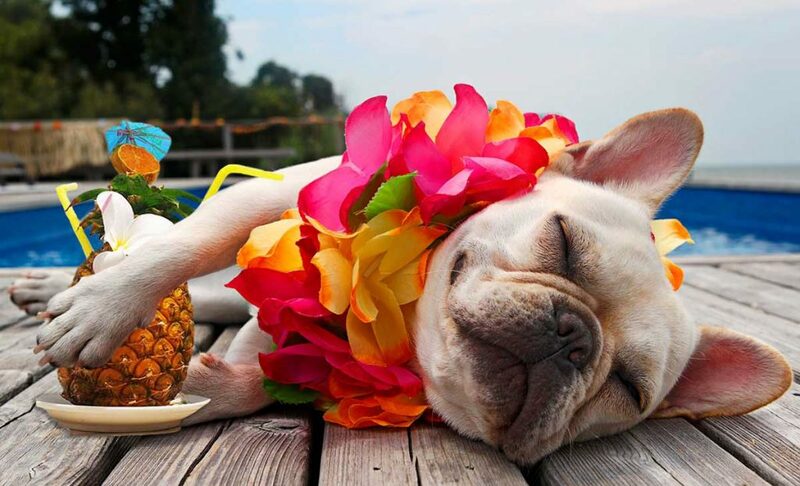 Your pet deserves a vacation. Contact Hebron Veterinary Hospital at (860) 228-4324 for information and tips to help make it a safe, fun adventure to remember.